World Cup final referee Howard Webb [ ] has defended his performance in Sunday's match and said he did all he could to keep control in a bad-tempered atmosphere. The Englishman received a barrage of criticism in the wake of Spain's 1-0 extra-time victory over the Netherlands after handing out 13 yellow cards and sending off Dutchman John Heitinga [ ]. 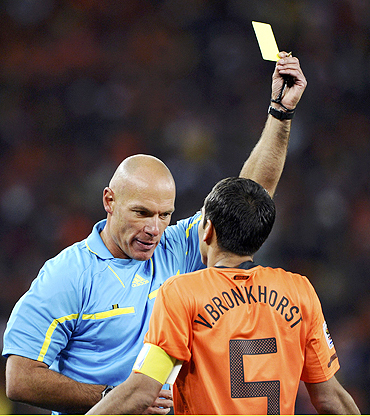 The final was marred by a series of rash Dutch challenges and unsavoury haranguing of officials. The Dutch were lucky to avoid a sending-off in the first half when Nigel de Jong [ ] kicked Xabi Alonso [ ] in the chest and was given a yellow card. Webb, the first referee to officiate in the Champions League [ ] and World Cup finals in the same season, said that despite the furore he had enjoyed his time in South Africa [ ].